Renowned as one of the best diving destinations in the world, if you do not take the plunge you probably are missing one of the spectacular sights of the Maldives, it's colorful underwater scenery. The coral reefs forming huge underwater gardens with a variety of colors, amongst which an even more wide array of fish in an assortment of colors shapes and sizes keep the viewer mesmerized. The Visibilty of the Maldivian clear waters is excellent. The question of where to Dive is more easily answered when asked in the negative. "Where not to dive?" Since the house reef of each island is also home to many fishes and a wide range of coral. However we list below the more famous dive spots in the country. Lion's Head is one of the spectacular dive spots in the Maldives. It is also a protected marine park with many projections as well as overhangs providing the ideal habitat for a large variety of fishes including, basslets, redtooth triggers, fusiliers , turtles , tunas, and napoleon wrasses to name a few. A wide array of beautiful soft and hard coral cover the reef. Kuda Haa is another protected park. It looks like a two humped camel's back and it rises from 35 meters coming up to 6 meters. The basslets, fusiliers and the butterfly fish which is everywhere, the blue-stripped snapper that wander at deeper levels. The sharks, moray eels, leaf fishes and cleaner shrimps are some of the many types that call this reef home. When such a large and colorful spectrum of fish intermingle with breathtaking sponges and corals the view is truly amazing. The strong currents that flow due to it's location on the eastern rim of North Male' Atoll, provides plenty of nutrients for both coral and fishes alike ,and in turn, makes "Girifushi Thila" one of the best dives in Maldives and an essential stop on the dive safari's itinerary. The major part of the reef is covered yellow, blue and orange soft coral and also a number of beautiful Seafans. The reef also has overhangs,caves and crevices from 30 meters upto about 10 meters .Amongst the large pelagic speicies , Gray reef sharks, Eagle Rays , Tunas and Barracudas are amongstthose seen at the reef. Located in the middle of the Tamburudhu Channel, the Middle Point is an excellent drift dive, and is for the experienced diver. It rises from as deep as 100meters to ten below the sea. Diving down the front point of the reef one would encounter large groups of gray reef, silver and white tip sharks, at deeper levels. as you come up you will eagle rays as well as baracuddas and tunas. The "Okebe Thila" is an essential and one of the most breathtaking dives in the country. The sheer volume of the variety of fish at times makes it diificult to see the reef and one could believe that he or she is in an aquarium. Although the reef is note very large, due to the volume it is difficult to do the entire reef in one day. This magnificent outer reef in north Male Atoll slopes from 10 meters below the sea to 25 meters and then ledges off to about 90meters. Grey reef sharks, eagle rays, silver tip and white tip reef sharks are common at around 30 meters. Giant barracudas, tunas, napoleon wrasses,fusiliers, blue-striped snappers and surgeon fish all add up to the colourfulness of this extraordinary reef. 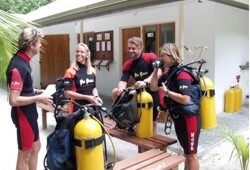 "Sunlight Thila" is a dive both for beginners as well as professionals. During the period March to October, the reef has a large inflow of planktons in its direction, attracting plenty of marine life including a considerable amount of Manta Rays and 10 can be visible at times. The reef is in reality two small reefs with a 70 meter long sand bottom in between the two. The sandy bottom enables you to kneel and watch the Manta Rays above from a more relaxed position. The reef derives it's name from the banana like structure in it's formation. One of first dives sites to be identified the banana reef is also not only well known for the variety of marine life and colorful coral , but also for it's strong currents. However this site is also an excellent dive with it's unspoiled plate corals, Napolean Wrasse, Moray eels and the blue strippedsnappers. The cargo vessel Maldives Victory which sank in 1981 , off the Airport island of Hulhule in North Male' Atoll also known as the "Maldives wreck" is now home to an ample range of marine life. the ship's main deck at a depth of 12 meters provide shelter form strong currents where you can see turtles, large groupers , trevallies and fusiliers. The dive is recommended only for experienced divers.